November 12, 2007 Peterson's 2nd wife Vicki Connolly's daughter Lisa speaks out ILL LISA, DAUGHTER OF PETERSON'S SECOND WIFE: "He was abusive to my mother. He was very controlling to her, watched every move that she had made. My mom was not allowed to have friends. She was not allowed to talk with our family. It was pretty much the only person that Drew had wanted her to have in her life was him." - "he was not being faithful to her, and he had not been faithful for many years. And I think that she knew and finally had just had it, just wanted out." November 12, 2007 "He used to tell my mother that he could kill her and make it look like an accident" ILL LISA, DAUGHTER OF PETERSON'S SECOND WIFE: "Our home was tapped. Their business was tapped. And he was doing everything that he could to hide what he was doing to her [Kathleen Savio]." - "there would be things that I would get in trouble for, and it would be, like, Oh, my goodness, how did he know that? " - "Yes, well, that's why I said she does — I mean, it just- the whole idea of him being out there, being loose (ph). I mean, I told her she doesn't have to be afraid of him anymore, but obviously, he had hurt her, you know, so badly all those years ago that she still thinks about that. He used to tell my mother that he could kill her and make it look like an accident." K-9 officer? ILL GretaWire Blog, “Just in: Big Development in the Sgt Peterson / Stacy Peterson Story!!" "Greta- When I was in high school we lived next door to the Petersons on Seminole Ln in Bolingbrook. At the time, Drew was a K-9 officer. Our dog, a shepherd and his dog used to run side by side along our back fences. This used to piss Drew off so bad, because it wore away the grass that he would beat his dog. It was not uncommon for my mother to be yelling at him from the back window to stop beating his dog. On one occasion his wife appeared in the front of the house crying and with a black eye. She had two teenage sons and they both were very quiet and kept to themselves. My father (also a cop) gave Drew permission to “watch” me and if he saw me on the streets or with my friends to send me home, which he did on only one occasion. He was then as you see him now on TV, Sunglasses, No smiling or reactions. Just stone cold. Subsequently, I went on to do my inernship with the Bolingbrook Police Dept. and became a Police Officer in Chicago. People knew this man was an abuser, but there is a Code when you are a cop to never tell on another cop. Police protect eachother. No one in my neighborhood, my parents included called the Police on Drew when he beat his wife or dog. Back then, you just kept quiet. 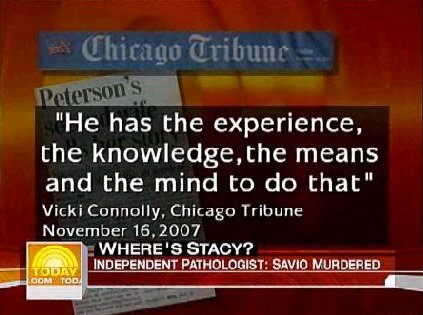 Im sure that is why his wife’s death was called “accidental"
Interview ILL 11/16/2007 (chicagotribune.com) "Drew Peterson's second wife tells her story"
"But in the first interview granted by one of his ex-wives since Stacy's disappearance, [Vicki] Connolly, 48, said Thursday that during their marriage an increasingly controlling Peterson told her he could kill her and make it look like an accident. While she couldn't believe he would ever do it, something prompted her to confide in Bolingbrook police officers who she considered friends. "So they would know he said these things to me," she said." "He [Drew Peterson] has the experience, the knowledge, the means, and the mind to do that," she [Vicki Connolly] said, her voice trailing off. "That's all I've thought about. ... I'm still working through it. I'll be honest." - "I believe that man had a disease to his ego. He's a legend in his own mind." "Peterson told her he could kill her and make it look like an accident" IL "For the last two weeks, Vicki Connolly has watched in disbelief and with conflicting emotions as controversy swirls around her ex-husband, Bolingbrook police Sgt. Drew Peterson." - "But in the first interview granted by one of his ex-wives since Stacy's disappearance, Connolly, 48, said Thursday that during their marriage an increasingly controlling Peterson told her he could kill her and make it look like an accident. While she couldn't believe he would ever do it, something prompted her to confide in Bolingbrook police officers who she considered friends. "So they would know he said these things to me," she said. She said Peterson would hit her but not hard enough to go to the hospital, and not often enough for her to expect it. It made it worse, she said, that she never knew it was coming. "It was mind games; it was head games," she said." "Peterson took steps to control her, including placing recording devices in their home. He would hit her and play mind games on her" ILL 11/17/2007 (www.suntimes.com) "The story of Drew's first wife"
"In a published report, Peterson’s second wife, Vicki Connolly, said Peterson had struck her when they were married and told her he could kill her and make it look like an accident. Peterson denied that Friday, saying, “Vicki is just mad because I cheated on her." "Vicki Connolly, who was married to Peterson for 10 years beginning in 1982, said in a published report that Peterson took steps to control her, including placing recording devices in their home. He would hit her and play mind games on her. The two divorced after Peterson and Savio began an affair. Connolly’s adult daughter, Lisa Ward, who lived with Connolly and Peterson when she was a child, told reporters Friday she feels lucky that her mom made it out of the marriage alive. “Of course,” Ward said. “My mom is a very strong woman for being able to.” Peterson dismissed Ward’s comment on Friday, as well. “Lisa’s mad because I'm a strong disciplinarian,” said Peterson." November 18, 2007 "Peterson rarely attended his sons' sporting events, but Brown and her husband would be joined by Peterson's second wife, Vicki Connolly." ILL 11/18/2007 (chicagotribune.com) "Peterson's 1st wife describes doting husband"
"In an interview published in the Tribune on Friday, Drew Peterson's second wife, Vicki Connolly, spoke of the extremes she experienced with him: wonderful at times, and "really bad" at others, including threats on her life. [Carol] Brown said Drew Peterson never threatened her or abused her during their six-year marriage between 1974 and 1980. She acknowledged, however, that he was a study in contrasts, a charming teenager and doting young husband who also could be controlling and, eventually, unfaithful." "Still, Brown was given full custody of their two children, and in 1981, she married David Brown, who was in Peterson's class at Willowbrook High School. Though she received only $250 per month in child support, "if the kids ever needed anything extra, whether it was sports equipment or extra fees in school, I would ask him and he would pay it," she said. "There was no argument ever." "Peterson rarely attended his sons' sporting events, but Brown and her husband would be joined by Peterson's second wife, Vicki Connolly." "She [Vicki] accused Peterson of playing "mind games" and claimed he bugged their house so he could keep tabs on her even while he was having an affair." "Peterson admits he "sought romance in other places" but denies he ever bugged the house." ILL 12/03/2007 (www.people.com) People Magazine, 'DID HE KILL TWO WIVES?" "From Peterson's own words to PEOPLE, and the record of his four toubled marriages, a portrait of the ex-police sergeant emerges - confident and charismatic but also controlling and sometimes abusive, drawn to vulnerable woman and eager to buy them things to make them feel secure, but just as quick to intimidate them to get his own way. The eldest of three children, his father was a strict ex-Marine, and his mother a diligent housewife. "My dad would get up to go the bathroom in the morning, and my mom would have the bed made," says Peterson. "I expected all of my wives to be like my mom, meticulous housekeepers, and they weren't." Peterson was 20 when he married his high school sweetheard Carol Brown, then 17; when she had a miscarriage, Peterson was "very supportive," Brown, 50, told the Chicago Tribune. But after six years and two sons together, she discovered he cheated on her, and they divorced in 1980. "I take full responsibility for that," Peterson says. "Carol was a good woman and I was unfaithful." "Two years later he met Vicki Connolly in a bar; they married six months later and raised each other's children from their previous marriages. "When it was good, it was wonderful, it was great," Connolly, 48, told the Tribune. "But when it was bad, it was really bad." She accused Peterson of playing "mind games" and claimed he bugged their house so he could keep tabs on her even while he was having an affair. Peterson admits he "sought romance in other places" but denies he ever bugged the house. "Vicki was a loving, warm person, " he say, "until things started deteriorating." ABC Interview NY "Peterson denies allegations that he threatened to kill three of his four wives. Peterson's second wife, Vicky Connolly, told the Chicago Tribune that during their marriage, Peterson told her he could kill her and make it look like an accident. "The ex-wives saying such a thing, they're getting even I would say," he said. "For me divorcing them or cheating on them or whatever." "I wish he would have stayed married to her [Carol] forever." "[Betty] Morphey said she didn't know anything about allegations of adultery that Peterson's former wives have leveled against him." 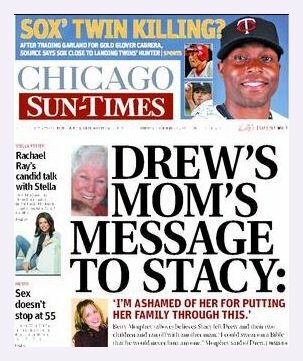 "I thought we were friends," Peterson said of Connolly" ILL 11/20/2007 (www.suntimes.com) "'He would never hurt anyone'"
"On Monday morning, Morphey watched her son's ex-wife Carol Brown on ''Good Morning America'' instead of Peterson and his attorney on the "Today" show." - "Had Morphey watched "Today," she would have seen her son say he was "worried" about his missing wife, Stacy, but again maintain she ran away with another man. "Your wife leaves you . . . and you're very much worried about her," said Peterson, who has been named a suspect in his wife's disappearance. Peterson also wanted Stacy, his fourth wife, to "publicly show herself so we can clear all this up." Peterson's new lawyer, Joel Brodsky, added he doesn't expect his client will be charged in either the disappearance of Stacy or the 2004 death of Savio, who was found dead in her bathtub." "Peterson said he was surprised by the recent comments of his second wife, who has described Peterson as violent and threatening during their marriage. Vicki Connolly was married to Peterson for 10 years beginning in 1982. "I thought we were friends," Peterson said of Connolly." "There was a voice inside of me that said there's something wrong here," Piry said." 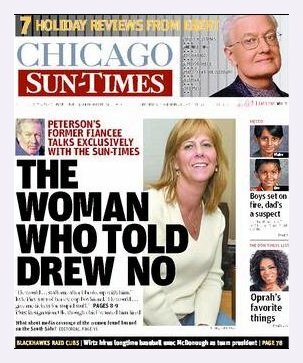 ILL 11/21/2007 (www.suntimes.com) "The woman who told Drew no"
"Drew Peterson gave her an engagement ring. Together, they picked out a china pattern." -"Piry was in her early 20s [1980 when he was married to 1st wife Carol] when she first encountered the handsome, mustachioed police officer. She worked part-time at a Bolingbrook gas station while attending beauty school. Peterson arrived in uniform to investigate a gas theft." - "But four months later, Piry called it off because she wasn't ready to become step-mother to Peterson's two young children from his first wife. "There was a voice inside of me that said there's something wrong here"
"He [Drew Peterson] would follow me and stalk me after I broke up with him," [Kyle] Piry said. "He would pull me over on a Friday or Saturday night and give me tickets for stupid stuff, like bald tires. They were ridiculous things." "In 1983 -- by this time Peterson was already married to his second wife -- Peterson and another officer arrested Piry as she arrived at work, Piry said. The officers said Piry had amassed too many parking tickets, Piry said. She was ordered into Peterson's cruiser and fingerprinted at the Bolingbrook police station, Piry said." - "Piry said she had to talk to some of Peterson's cop friends to persuade her ex-fiance to drop the charges." ex-boyfriend murdered in 1992 ?? ILL "NATIONAL ENQUIRER: Ex-cop Drew Peterson is the Enquirer's new O.J. Simpson. The tabloid scooped the mainstream media numerous times during Simpson's legal travails in the '90s, and in its four pages of Stacy Peterson disappearance coverage, it reports some illuminating tidbits, including that Illinois state cops "are now taking another look" at the unsolved murder of a man dating Peterson's second wife, Victoria, after she divorced Peterson in 1992. But that's according to an unnamed "source close to the investigation." April 3, 2008 Peterson's Wife #2 Testified before the Grand Jury ILL 04/03/2008 "Drew Peterson's 2nd wife, former fiance appear before Will County grand jury"
"The second wife of Drew Peterson appeared Thursday before the Will County special grand jury investigating the death of Peterson's third wife and the disappearance of his current wife. Vicki Connolly, who was married to Peterson for 10 years, declined to discuss her appearance before the grand jury as she left the Joliet courthouse annex. Connolly told the Tribune last year that Peterson was controlling and told her he could kill her and make it look like an accident." "On Thursday, Peterson said he had no idea why Piry and Connolly were summoned to testify, or what information they had to offer. "They do come out of the woodwork, don't they?" he said. Peterson added that he believes Piry has parlayed their former relationship into media appearances, "and [as for] Vicki, when you have an ex-wife, they're not really happy with you anyway." May 8, 2008 "Lisa Ward, daughter of Drew Peterson's second wife Vicki Connolly, also testified Thursday" ILL 05/08/2008 "Sister of Peterson’s former wife testifies before grand jury"